Presidents and representatives of several graduate associations from the faculty of Arts and Science voiced their concerns about the structure of the GSA at a congress held Friday afternoon. Arts and science graduate students don’t have their own faculty association, and many of them feel that they’re not being well represented at the GSA. The idea behind the conference is to create a new smaller forum to bring concerns to, instead of the GSA. Faculty associations for engineering and computer science and business graduate students already exist. “We’re a small fish in a big pond,” said Ed Taylor, an executive at the Graduate Philosophy Students’ Association (GPSA). “A lot of students in Arts and Science are off doing their theses, so our representation is not as strong as that of the other associations. “I urge you all to consider the possibility of creating our own faculty association,” Taylor told the congress. 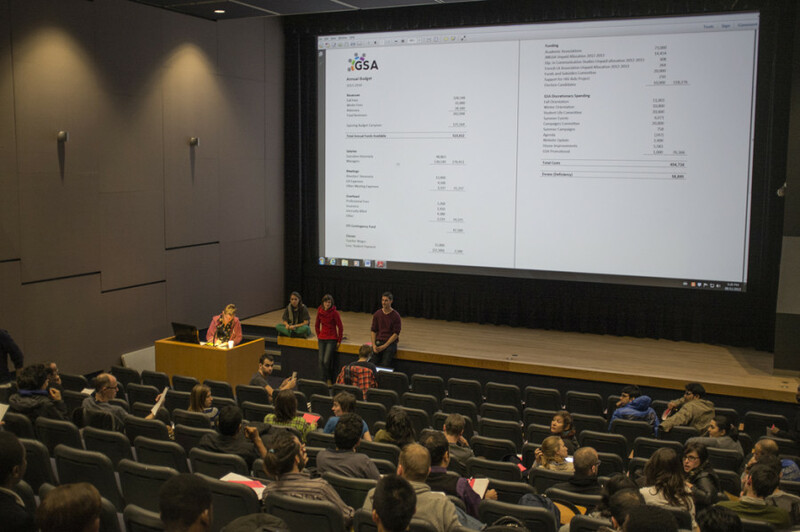 Engineering and computer sciences students outnumber representatives from other faculties with eight members on the GSA board of directors, compared to only two for Arts and Science and one each for Fine Arts and John Molson School of Business students. That has certainly caused friction in the past. Socio-culturally speaking, Arts and Science and Fine Arts students tend to be more left-leaning than those in JMSB or Engineering and Computer Science. “I’m really interested in how UQAM structures itself,” said Pierce Nettling, president of GEOGRADS, the Geography, Planning and Environment Graduate Students Association. “I never get the impression of UQAM’s graduate students association as a body of its own, but the emphasis is placed rather on the faculties and the departments—there are no cliques,” he said. In fact, UQAM doesn’t have an umbrella organization representing all undergraduates or graduates. Speaking on behalf of GEOGRADS, Nettling proposed the idea of disbanding entirely from the GSA. According to Jon Summers, an Arts and Science representative, it’s difficult to get people to go to council meetings at all. The one held Friday, which lasted for three hours, saw only a handful of department representatives. Some believe that the interest is just not there. “We’re dealing with a lot of international students and we keep comparing ourselves to UQAM, but UQAM is a French school and most of the students there are going to stay in Montreal or in Quebec,” said Junesse Christiaans, a student representative for the Department of Education Interdisciplinary Graduate Student Association. Christiaans made the point that there just isn’t the same level of interest in adequate graduate-level representation at Concordia that there is at other French-language universities. While the number of departments represented at the meeting was not overwhelming, according to Summers, it’s a step in the right direction. “I’m pleasantly surprised with the outcome,” he said. Though there were disagreements on some issues, everyone was of the mind that more congress meetings need to take place—at least two per semester, according to Summers. “People are already organizing for the next congress, so that’s a very good sign,” he said. “I think we’re moving in that direction, whether we’ll end up there is not up to me to decide,” Nettling said on disbanding from the GSA. UPDATE: Parts of the lede has been reworded and a sentence has been added in the third graph for clarification. Readers are invited to find the minutes of the congress on the GSA’s website.